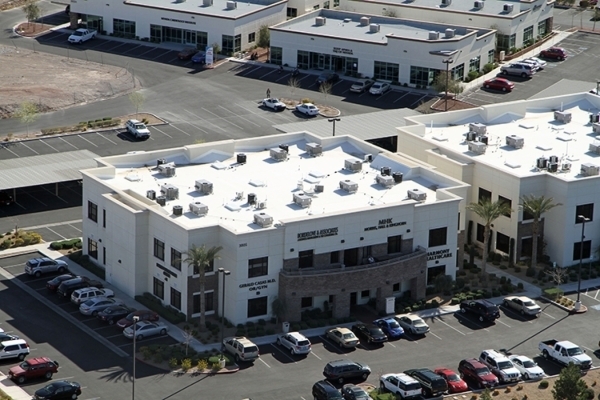 CBRE Las Vegas was behind nearly $40 million in closings in three projects in July. In the biggest deal, Charles Moore, Marlene Fujita Winkel and M. Laura Hart represented Hughes Airport 57 in its $30.3 million sale of three buildings totaling 168,247 square feet inside the Hughes Airport Center. The buildings are at 840, 880 and 950 Grier Drive. They’re 100 percent leased by tenants, including MGM Resorts International. Griffin Capital, an investment and management company in Los Angeles, bought the three buildings. Griffin’s portfolio encompasses 24.2 million square feet of space valued at $4 billion in 28 states. Moore, Fujita Winkel and Hart also represented Merion Realty Partners in its $8.7 million sale of a 34,492-square-foot property at 11500 Southern Highlands Parkway to Empire Square Group. Southern Highlands Prep School is the long-term tenant. They advised Bank of America in its $800,000 sale of 5,790 square feet at 6980 O’Bannon Drive. Lance Alderette of Rossum Realty represented buyer Kirk Kaplan. Moore said the deals signal ongoing economic recovery in the local market, as well as increasing interest in the city’s real estate among local, national and foreign investors. Fujita Winkel added that the brokers have seen a substantial jump in owner-user sales, which she said is a result of consumer confidence and availability of SBA loans at affordable interest rates. 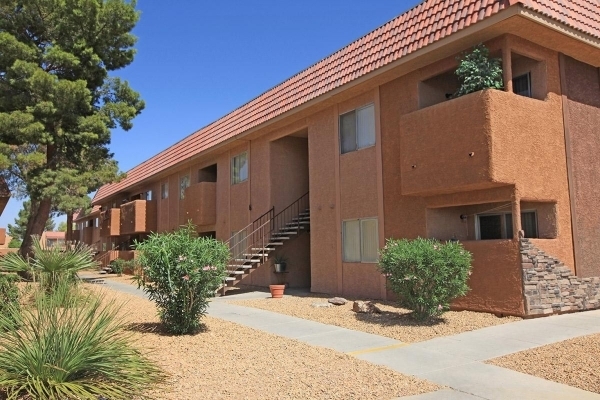 Regency Heights, a 144-unit apartment complex at 36509 E. Lake Mead Blvd. in Las Vegas, has been sold for $6.768 million. The buyer was Westland Regency Heights LLC; the seller was Regency Heights LLC. NAI Vegas represented both parties. • Scot Marker represented Watumull Enterprises in its $7 million sale of a 3.85-acre retail property inside the Decatur Twain Plaza at 3650 S. Decatur Blvd. Mez Desert Properties was the buyer. • Frank Marretti and Robert Henn advised Legacy House of Centennial Hills LLC in its $2.4 million purchase of a 3.5-acre parcel of vacant land near North Durango Drive and West Centennial Parkway. • Greg Pancirov and Mike DeLew represented Timothy A. Rivard in the $1.55 million purchase of an industrial property at 3890 E. Craig Road. Dean Willmore guided the seller, JW Flooring Covering. • Pancirov and DeLew also represented HB Nevada Properties in its $1.07 million purchase of a 0.49-acre industrial property at 6565 Arville St.
• Willmore represented The Veneman Group in its purchase of a 12,900 square-foot industrial property at 4460 Cheyenne Ave. in Las Vegas. The transaction amount was $720,000. C. Roger Jeffries III of Sun Commercial Real Estate advised the seller, BMR Global Corp.
• Vince Schettler represented Mosaic Five LLC in its purchase of 2.35 acres of vacant land near the northwest corner of Martin Luther King Boulevard and Alexander Road in North Las Vegas. The transaction amount was $150,000. • Cathy Jones, Paul Miachika, Jessica Cegavske, Roy Fritz and Riley Foley of Sun Commercial Real Estate represented North American Financial Corp. in its 38-month lease of a 4,566-square-foot office building at 4730 S. Ft. Apache Road, inside Colonial Plaza. Tanner Peterson of CBRE Las Vegas advised landlord Colonial Plaza Office Center LLC in the $340,407 agreement. • Lagomarsino Law Office leased 3,563 square feet of office space in the Seven Hills Medical Center II at 3005 W. Horizon Ridge Pkwy., Suite 241, in Henderson. Bridget Richards and Jason Lesley of Colliers International represented the lessor, Horizon MOB 3005 LLC. • Coach Inc. leased 5,169 square feet of industrial space in the Eldorado Business Center at 7485 Dean Martin Dr., Suite 103, in Las Vegas. Dean Willmore of Colliers International represented the lessor, TLF Logistics II Eldorado Business Center. • F&F Electric Inc. leased 2,827 square feet of industrial space in the Northpointe Business Center at 4241 N. Lamb Blvd., Unit 110, in Las Vegas. Dean Willmore of Colliers International represented the lessor, FJM Holdings LLC, and the lessee. • Gortronix leased a 960 square-foot office in the Valley View Business Center at 6380 S. Valley View Blvd., Suite 404, in Las Vegas. Renae E. Russo of Colliers International represented the lessee.